The subject arose at Jessewave’s the other day, about fanfiction being reworked, repackaged, and offered for sale. I posted a reply there, but the rest of my opinionated rant thoughts needed about a thousand words that didn’t fit into a blog comment. You have been warned. I don't follow a lot of fandoms, so it would probably be pretty easy to slip a converted fanfic by me on canon or on familiarity. Where I start wondering is if the characterization seems flat or if the rules for a specialized universe aren't spelled out. Then I figure that anyone in the know would be aware and have filled in the blanks for themselves. And that makes me mad on a couple of levels. First, because it isn't good storytelling. I don't want to have to do the author's work inside my own head. And the canon author did the work here, but I don't get to read it, I just get the next generation down. If you’re part of the fandom and expect the characters to do certain things without a lot of explanation, you get it, but if you don’t know the backstory, actions may seem to come out of the blue. Every story deserves to have developed characters, and something new about them should come out even in sequels. In fanfic, there’s ready-developed characters that only have to be wound up and let go—the author doesn’t have to do that work. And when the story is converted, that work may or may not get done, or only as far as removing identifying characteristics, but not developing. That kind of thing shows. The assumed world-building happens with shifters especially but not only. Something happens that makes perfect sense only if you use Canon Author XYZ’s rules, but they aren’t mentioned anywhere; the reader is assumed to know. Or the author is so steeped in that universe that they forget to say. Or the author is so steeped in that universe that they fail to consider that each world should be unique, and fail to set out the rules for this world. And if the reader can’t figure out who XYZ is and therefore what the rules are, and thus why it happened, it’s a big pile of WTF. And if the reader can identify XYZ and then the plot points make perfect sense, they know they've been handed converted fanfic, or something that hasn't been thought out well. Which one is worse depends on the reader, I suppose. Or it's an overlap of the two situations, because the conversion has been done clumsily. Second, I begin to doubt if it's the author's best work. If something from the "back list" is getting the serial numbers filed off and sold under a new title, it probably dates from an older period in the writer's life. Writers improve their skills with every new work. Especially in a genre where we hope for regular releases from our favorites, the pressure to produce can drive someone to recycle. But I don't really want something from halfway up the learning curve from 8 years ago. I want the best the writer can do now for a new release. Of course, if the characters are still Sam and Dean under the thin veneer of new names but not original personalities and quirks, that’s another brand of dishonesty. That’s using someone else’s intellectual property for one’s own gain. Have fun with them if you like, put it up for folks to share if that pleases you, but as soon as you start accepting money for something that’s not entirely yours, you’ve stolen something intangible but real. This may be the most important aspect for a lot of people, but I put it down here because I started with the problems the reader can easily see. Cardboard characters and half-done world-building show to everyone: fanfic origins may not. I don't have an issue with fanfic as fanfic, because once a book is out there, it's there for people to talk about as they see fit. They might review it, and the review could be positive, or it might not. Writing fanfic is a kind of review, which says "I love your characters so much I want more stories about them." Selling those stories unchanged or barely changed means something different, and it sounds like "I"m not entirely honest and will profit off canon author's work if I can." Change it enough so it's entirely original, and I won't harsh on it. But why not spend the effort on a truly original piece? A fanfic can be so entirely AU (Alternative universe) that nothing is recognizable except the names, and I do think that’s another beast. At that point the author might as well have named the characters Mick and Larry to begin with, and possibly would have except for wanting the audience that comes bundled with the canon names. Authors do love readers, and a little ride on a coattail with an AU doesn’t seem like a big deal. If it’s that original and well enough done that fans of the canon accept it for what it is, ie not canon, change the names and sell it as original, because that’s what it is. It was mismarked at the start. Real People Slash stories have their own niche as far as I’m concerned, and partly they squick me and partly they amuse me. The authors have little to go on for the characters’ personalities except what is publicly available, and whatever they make up, although the groups of authors may arrive at a consensus idea of personality. So in a lot of ways, these are original characters with familiar names, and any adventures they have are original fiction. The squick part comes from knowing that there are real people attached to the names, who probably don’t want to know what their fictional counterparts get up to. Or possibly wish they were having that much fun. But still, change the names, don’t make the characters recognizable as real people, and DO make them well-rounded and interesting. Then have at it, as long as it’s the best work the author is capable of doing now. The stupid plot points that can go unquestioned or even applauded in fandom won’t fly with me if it’s offered as original, and I have seen some really stupid plot points, some for sale. I see lame, ‘not developing anything’ scenes and wonder if the fandom spoke louder than the editor. Don’t do that to the readers. Either the lameness or the wondering. Be assured that I will not find it cute to spend five pages diverging from the plot to watch an Ianto-equivalent-now-named-Bill try to swat a fly. That fly had better pertain to the plot if it's in there or I will swat the story. Maybe these outwardly pointless scenes are nods to some fandom I don’t follow? Someone else might see the joke, I suppose, but I’m spending my limited time on this story, I don’t want something designed to go over my head if I’m not one of the insiders. A phrase or a sentence that has an extra layer of meaning to the fans, no big, but whole scenes that need a canon background to “get”? Not fair, and not good storytelling either. There’s at least one m/m publisher out there that categorically rejects anything that used to be fan fiction. They don’t want the liability that comes with the copyright issues, and I can’t blame them. There’s another that isn’t nearly so picky. I read work from both, but when I read stories from the first pub I don’t devote a tiny fraction of my brain to being alert to clues that this book may have started life in another form with someone else’s characters. If I wanted universe ABC, I’d read canon, or if I was desperate, I'd check aff.net, the Pit of Voles, or a specialized archive, and know exactly what I was getting. I just want to enjoy a fine, original story. I think I may be more oblivious than most. I'm just clueless and it would never occur to me to look for a fandom link, for one, there are a billion of them so how would I know which one it is? (God knows some are pretty obscure.) Unless it's two brothers hunting demons (yay twincest LOL) or a boy wizard with best friends, I'm pretty much out of the loop. I know there was a comment made by Wave on the Alex Bekins book saying it matched completely with characters from Stargate ... something. Umm. I watch all versions of Stargate from time to time when there is nothing else on, I didn't see it. Which characters? It wasn't set in outerspace with a Stargate, so whatever. Maybe it was a coincidence, there are only so many personality types to go around. *shrug* I enjoyed the book, end of story for me. When I see the issue of a backstory seeming to be known (when I start wondering if there was another book that explained X and I missed it), I tend to assume the writer just got caught up in their own heads. I've done it, or been tempted. "I" know why Billy is in the closet and afraid to tell his boss and thus rejects a potential boyfriend. I just forget that because I'm in Billy's head, not everyone else is and I have to tell them. It's not that there is another story out there somewhere explaining Billy's motivation, I'm just too close to it to realize that not everyone knows Billy like I do. So I probably pass of a lot of fandom stuff as an author just "forgetting" that we aren't in their heads. I don't have ESP, in real life or with fictional characters. Now if stories are available for free, not taken down and then published with a bit of a sly wink, don't tell readers where to find the free version, that stinks and is sneaky and tricksy. I don't like that. But as far as where the ideas come from, I'm pretty easy. Holy cow, my comment's as long as your post. LOL Sorry. The book I mentioned which I didn't name, is now reviewed on the site so I can name it - it's called Written in the Stars and the main characters are identical to two characters in Stargate Alliance, in every respect. The author didn't even attempt to hide it and she didn't bother to change the name of one of the characters. If I were the writers of the television show I would look into some sort of legal redress. This whole situation is getting to the point where we (readers) are being given so much recycled material, and at times even totally recycled fanfic stories that I wonder why bother to buy anything because for all I know (except for a few epublishers) most of them don't seem to care if they sell former fanfic stories that we can find online. Only I'm so ignorant about where to find it I would be completely at sea. I understand what Crys is saying about the worlds being incomplete when the authors try to hide the source and delete some of the original material, but we're still buying recycled books. This problem will only get worse because all of these authors think they will be the next E.L. James whose book is so bad I don't know what the publishers were thinking to sign her, but to each his own. @Tam, that's exactly it, if there's backstory that other people know, it ought to be original backstory available to the interested reader who should not be expected to comb through forty thousand fanfics or watch 6 seasons of canon. I would have missed the Stargate characters, because that's a fandom I don't follow, don't think I've ever seen the show. That said, the most amazing m/m romance I've EVER read was a Stargate fic that I lost before I bookmarked it, and it didn't assume I needed to know what was going on already, either, it was perfect on telling you everything you needed for that one fic and that one relationship. Too bad little things like title and author didn't stick as well as the romance. Sigh, I'd read it again and again. But still, whether the character is not fleshed out because the author has everything in her head or because there are 6 books by the canon author doing the heavy lifting, that's bad storytelling. I'll forgive legitimate bad storytelling (eventually) but not theft. The EL James thing perplexes me, because a lot of the hype is like OH GOODY! 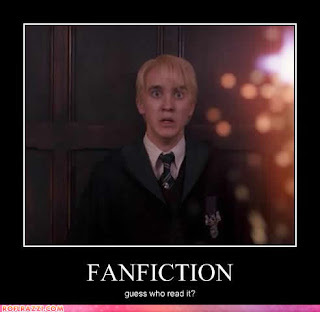 IT'S FANFIC! like that's a good thing. Since Twilight is on my "I want those hours of my life back" shelf already, I don't want anything based, however loosely, on it. I did peek at the first chapter, and between a muddled opening sentence and a mirror scene *done to death, lady! * on the opening page, I think we go with NO. But still, no matter how it's changed, just having that background is riding on another author's success, because it probably would sink without a trace if it didn't. The publishers aren't entirely stupid -- catching a big thing and making it bigger (no matter what the quality is) is scooping up money. The books came with half the publicity campaign already done, and even if it's AU out the wazoo, the association with a big name helps. I want to be glad for any author's success, but when I see stuff like this take off and wonderful books that are original from top to bottom can't get a notice, there's something wrong. I read that book Wave, and I didn't see it, but I don't watch the show that closely I guess. That kind of thing doesn't bother me since it wasn't in the same setting, but that's just me I guess. Sorry, that should be Stargate Atlantis not Stargate Alliance. My typing finger is all askew, Crys and Tam. Tell you what, I will make the captcha go away and see how long it takes the spambots to flood me. I don't have Akismet on blogger. I know the spambots come by every day just from the stats. I know this is off topic and this is an early post but I just wanted to say “Thank You” for letting me be included in your Hop Against Homophobia. I am afraid I am not a talent m/m fiction writer like yourself but I am an avid reader of it.